Nine bodies were found Saturday night in the El Tejar fraccionamiento, authorities presume that the victims were kidnapped with a man who was found executed in front of the Crystal Plaza. The events were registered on Lomas de Tejar Avenue in the aforementioned fraccionamiento, where a motorist phoned the 911 emergency number to report a van with the tailgate open and human bodies in the interior. Elements of the Secretariat of Public Security attended and confirmed the discovery. The preliminary report from the authorities said that the victims were related to a man who was executed in Lazaro Cardenas on Saturday afternoon. 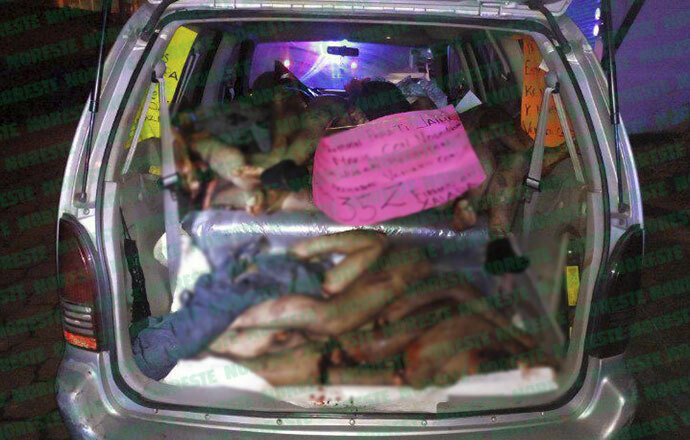 The victims were found in the back of a Nissan van, registration plates YHR 7449, which was removed by persons of the Attorney General of Veracruz office with the body parts being removed by the Medical Forensic Service (Semefo). Inside the vehicle were three cartulinas, all read, " For not respecting the agreement, we come with all 35Z". The bodies were driven away in the same van in which they were discovered, by Semefo elements and Ministerial Police. A source revealed that the victims had been kidnapped in the Laureles colonia, others in the La Favorita bar, and the rest in the Higueras colonia. 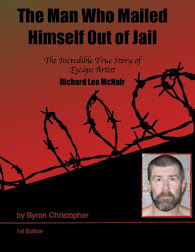 Saturday afternoon, a man was executed as he got out of a vehicle and tried to flee, however, he was shot by his captors in the plain light of day and before dozens of witnesses. 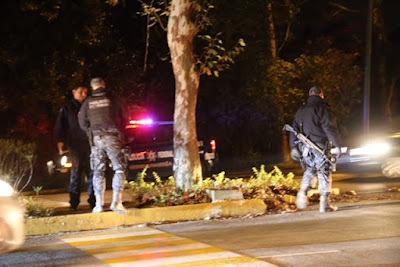 The victim was kidnapped by a group of armed men outside of his house in the Laureles colonia in the company of three others, the victim was Rodolfo Viveros Morales, 43 years old, who was family of a functionary of the Attorney General of Veracruz. At this point in time, the identity of the victims in the van are unknown, however, around 23:00 hours, three family groups arrived at Semefo to ask about the events in the El Tejar fraccionamiento. And the clueless US State Department didn't give a "no travel" to lost narco state Veracruz. @7:38a.m yes they did i believe from what ive read! Zetas were there first. So if politicians make deals with cjng obviously zetas will kill them. I don't know who owns the plaza in Colima, but there sure are a lot of killings going on there. My wife is from down there and just this past November my cuñado was murdered and just yesterday a family friend was found dead and wrapped in a blanket. So sad because Colima is such a beautiful state. a fraccionamiento is a complex, tract or development, developed by the same contractor. or a planned community. can be, but not necessarily. it is a track of similar homes built by the same contractor. unlike colonias. there are many that are not gated. You are correct Chivas. I live in a colina here in Chihuahua. They gated the house on the other side of the street and it is all still called "Colonia Companario". I know a lot of Fraccionamiento's here that are not gated. A lot of them. no more comments on this please. If you live in Mexico you know this is accurate. They drove the van away with all those body parts in it??? Why not lift it onto tow truck and cover the bodies. Only in Mexico would someone simply jump in and drive off...unreal. And get the tow truck or the ambulances dirty? Why didn't the killers and the butchers just make their victims pozole or carniasadas? 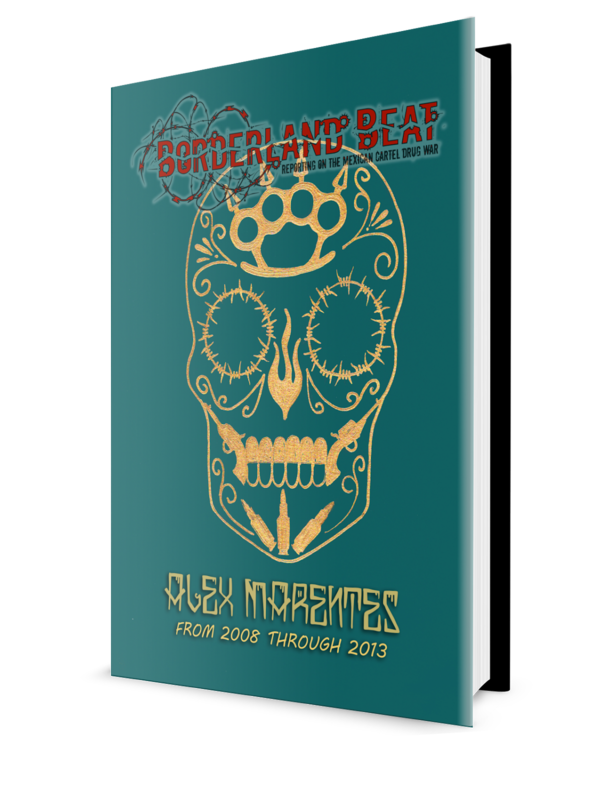 Mexico is going from bad to worse, making the government work too much for the pittance. Who is 35Z? I doubt she likes to see her name splattered on cardboards like that. They put it on a flatbed truck....misinterpretation is all. Ha, exactly what I was thinking. "Hold on guys and gals". No they did not. The van was transferred on a flatbed truck with the body parts still inside to the forensics department. Simple mistranslation Spanish/English. The van is a crime scene and cannot be contaminated by others fingerprints and DNA no matter how incompetent the judicial system is. They drove the van to the forensics on a flatbed tow truck. Meaning the truck drove “with the van” secured as any tow service does. I am a proud corrido writer. Always lots of good material! Mexico needs to turn into a police state as the only way to quell violence. they are driving themselves in with everything. 7:41 Cdg and cjng working together? Explain please? The biggest Cartel in Mexico is the government, thats why this will never end. As long as someone pays they will let them control what the government should be caring for, for its citizens. They steal the people's money and rent out the plaza to narcos. Win win for the politicians. Los de los Z35 son los mas pesados de los del CDN o gente del Lalo Treviño. Sus reclutos de donde controlan los del CDN van pa Vera creo es su plaza mas fuerte que tienen. Asi que ese grupo del CDN aun se quedo con la clave de Zera en el nombre aunque cdn y zetas se esten peleando?